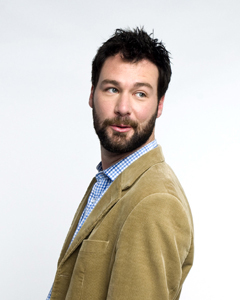 Ottawa-born Jon Dore spent three years co-hosting Rogers Television’s Daytime sharpening his skills to a fine point. For his work, creativity and quick improv skills, he received the Impression Award for best on-air personality in 2001. Many of Jon’s hosting skills come from working as a stand-up on the comedy club circuit in Canada. In 2003 Jon took part in the Homegrown Comedy Competition at the Just For Laughs Festival in Montreal, and has since returned to the festival to host the competition the past few years. He also had a sold-out run for his Toronto Just For Laughs Festival show, aptly titled “The Jon Dore Television Show’s Writers, and Jon Dore of the Jon Dore Television Show’s Stand-up Comedy Show, Show”. Jon has recently appeared on his own Comedy Now! special for CTV, and on The Comedy Network’s The Jon Dore Television Show , and on CTV’s Canadian Idol, as the former wacky correspondent reporting on the pressures and excitement of the contest with his unique brand of humour. On November 11th 2010, Jon Dore became the first stand up comedian to perform on Conan O’Brien’s new show on TBS.